To suit: Tohatsu, Mercury and Mariner. Dimensions: Linkage A – 78 mm +/- 3mm. Linkage B – 159 mm +/- 3mm. Linkage C – 95 mm +/- 3mm. 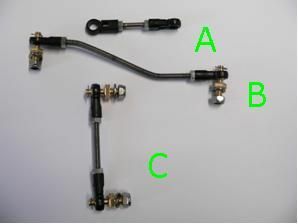 The MCM Throttle Linkage Kit uses M5mm stainless steel threaded rod with black caps, ball joints and lock nuts in place of nylon snap fittings and 3mm bent brass rod. 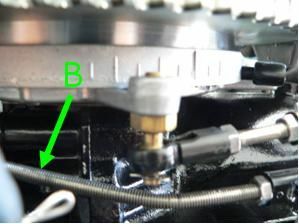 In harsh Surf Rescue conditions ,the nylon snap fittings have a tendency break leaving the motor without any throttle. 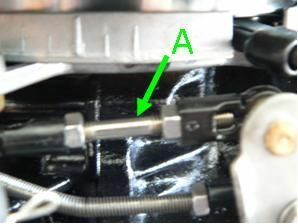 The factory linkages had to be adjusted perfectly or else the brass rod would pull out of the nylon snap fitting. 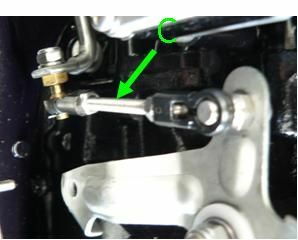 The MCM Throttle Linkage Kit is stronger, more durable,easier to adjust and also has retaining clips to stop the black caps coming off. 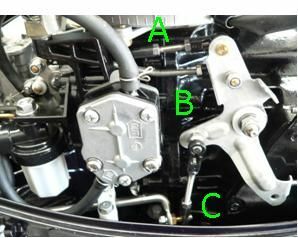 The MCM Throttle Linkage Kit allows you to adjust the throttle cam to pick up roller relationship, whereas the factory linkages are not adjustable. Material: 316 stainless steel, M5 threaded rod, brass ball joints, black rod end caps, M5 stainless steel lock nuts and stainless steel clips.